Can I pay online if I first book with “pay at property” option? 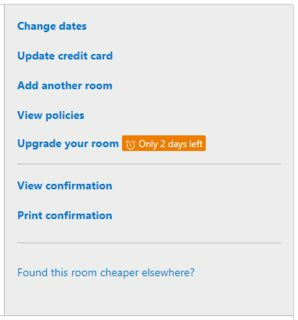 I chose the "pay at property" option while booking a hotel room on booking.com. Now I changed my decision to pay online, but couldn't find a way to do that. On the "bookings" page, I see the following menu beside my booking. Isn't it possible to pay online hereafter? I have had great success with calling booking.com customer service directly. I would suggest doing this as they will be the best party to answer your question. It is usually a long hold time but worth the wait to speak with someone personally. I sent a message to Booking.com customer service (via the "Get in touch" page) and their reply was approximately as follows. If you would like to withdraw the entire payment of the facility from your credit card, please reply to this e-mail and send us your request. Once we receive your prepayment request, we will share it with the premises and, if deemed appropriate, will be withdrawn from your credit card. I was expecting a self-driven way to pay online, but it seems that there is not without contacting the customer service or the hotel. Not the answer you're looking for? Browse other questions tagged bookings booking.com payment or ask your own question. How can we pay the Canada visa application fee after the first payment failed? Will I be charged if the hotel cancelled the booking (on booking.com)?